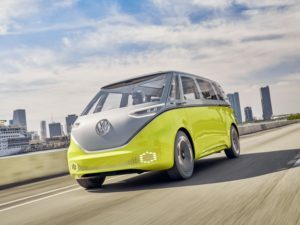 Volkswagen has greenlighted production of an electric van and MPV, said to be inspired by the split-screen Transporter and Microbus of the 1950s. Previewed by the I.D. Buzz concept shown earlier this year and due to launch in 2022, the newcomers will join Volkswagen’s I.D. electric car range, based on a new platform which packages the batteries and drive systems in the floor to maximise interior space. The concept is just under five metres from end to end – similar in size to a standard-length T6 Transporter – but with a wheelbase that’s as long as the extended version. Volkswagen has confirmed it will be offered as a commercial vehicle as well as an MPV, the I.D. Buzz hinting that the latter could have eight seats on board. Europe, North America and China are seen as key markets, and will offer highly-automated driving modes on both versions. Details about the drive system have not been confirmed, and are likely to depend on technological advances in the meantime, but the concept car produced 369bhp through motors at each axle and offered a range of around 375 miles (NEDC). On-board charging at up to 150kW means 80% of that range can be recovered in half an hour.